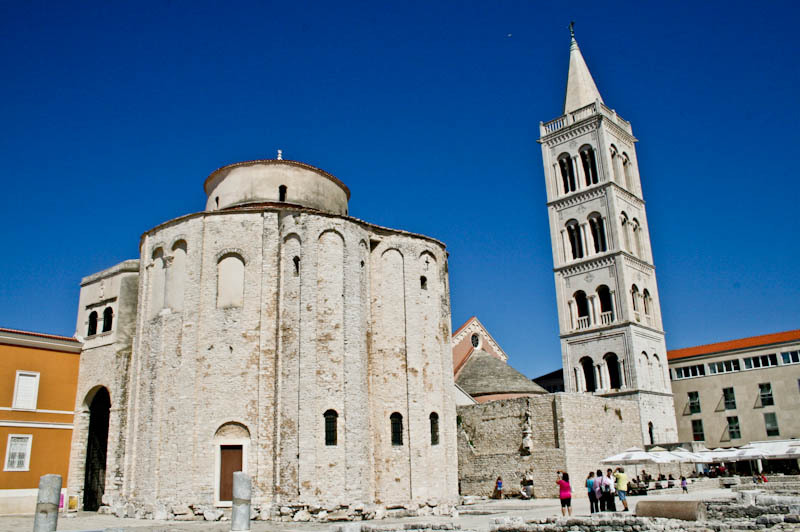 Zadar is the main city in North Dalmatia with over 76,000 inhabitants. Most famous for its Old Town, set in a peninsula that is completely pedestrianised, the town has numerous Roman and other wonderful sights – some rather modern – so is a delight to visit. The town is also very easy to reach, whether flying in from elsewhere in Europe (it has its own airport) or by bus from other destinations in Croatia. There are also internal flights to the town’s airport from other places in Croatia. Zadar is perhaps sometimes overlooked as a place to visit in Croatia, possibly because it is slightly out of the way of the delights further south in Dalmatia. However, it really is a charming town and you won’t regret spending some time here. Why not start your holiday here before heading further down the coast? It’s also a very suitable base for day trips to locations such as Plitvice Lakes, the Kornati islands or Krka National Park. With great transport connections, find out how to get there from other parts of Croatia by bus, train, plane and ferry, as well as details of international flights and ferry services. Some of the best places for food and fun! Please see our Accommodation in Zadar page for details of hotels and boutique hotels (there’s a wide range), and private accommodation options in the town. The area code is 023.